Home > Wedding & Event Decor > Centerpiece & Tabletop > Vases > Vase - Half Moon Bias Slant Cut Clear Glass - 15 3/4"
Your personality is chic and unique so get a centerpiece vase that truly reflects your sense of style! 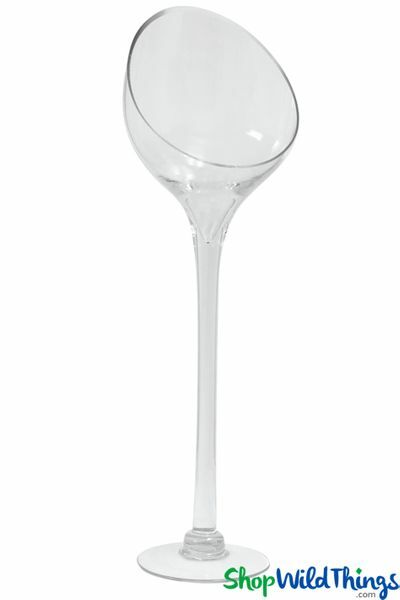 Our new Half Moon Glass Vase has that distinctive look and sophisticated elegance to set your Decor far above the norm. This half cut slanted vase stands 15 1/4" tall and the angled, oval opening is 4" wide by 5" long. The glass on the bowl is 1/8" thick. 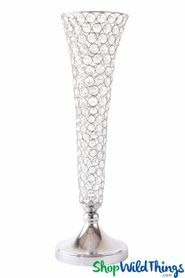 For weddings, receptions, parties and special occasions, this contemporary vase totally stands out and is ideal for showcasing floral Decor as well as making an impressive candle holder! From the bottom angled edge the bowl is 3 1/4" deep; meaning you can fill it about 3" deep with water or jelly Decor (water pearls). 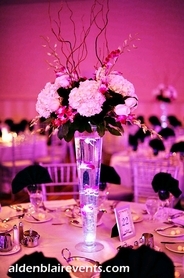 Then decorate with live cut flowers or artificial foam roses. Add color and light with an LED submersible light or float an LED candle. Our LED Floating Rose Candle looks extraordinary in this half cut vase! You can also fill will diamond confetti, loose pearls and silk rose petals. The bottom of the bowl has about a 1 1/4" depression which can be illuminated with an inverted LED submersible light or use the light upright to accentuate a tulle pom pom ball. 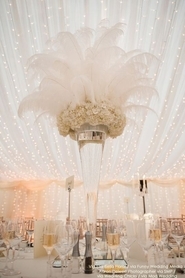 Ostrich feathers (cut to fit) also look pretty ritzy in this tall stemmed vase! Pillar candles around 2" - 3" tall are a simple and classy look and by adding a bit of greenery or acrylic garland strands, it's easy to coordinate this vase with your colors or theme. This memorable accent piece also makes an excellent candy dish! My friends and family where asking if they could keep these after my dinner party was over! These were a hit. ProsMade my dessert table stand out.